The place of Europe in post-Cold War national mythologies of different countries varies widely. In three arguably most dramatic examples, Poland rethought itself as “the somehow decentered heart of Catholic Europe” (Dayan & Katz, 1994, p. 166), while Russia gave reasons to conclude it “leaves the West” (Trenin, 2006, p. 87) and Ukraine stuck with its view of Europe as a normative example (Orlova, 2010, p. 26). To what extent does this remain true if one is to look empirically at the discourses that currently inhabit news media? 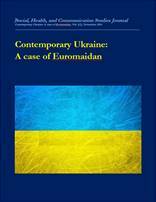 This paper points out, on the example of the public discourses around Euromaidan, to how narratives of Europe are instrumentalized in political discussions in the three countries that followed very different paths since the collapse of the communist bloc. The presentation includes results of qualitative analysis based on an open coding approach; the focus rests on the most prestigious news outlets (Rzeczpospolita, Gazeta wyborcza; Izvestia, Kommersant; Dzerkalo tyzhnia, Korrespondent) but also includes important online blog platforms. Roman Horbyk was born in Kyiv, Ukraine. He accomplished his BA and MA degrees with majors in Journalism at Kyiv National Taras Shevchenko University. Roman received an international Master’s degree in “Journalism and Media within Globalization: a European Perspective” in 2012 with a joint certificate from Universities of Aarhus and Hamburg, having also studied in Amsterdam and completed courses from UC Berkeley. He is currently a graduate student at Södertörn University in Stockholm, Sweden and is expecting a PhD thesis defense at Kyiv National Taras Shevchenko University.